A short documentary about the story of Canada’s massive Mackenzie River Basin. Is water a commercial good like running shoes or Coca-Cola? Or, is water a human right like air? Water On The Table is a character-driven, social-issue documentary by Liz Marshall that explores Canada’s relationship to its freshwater, arguably its most precious natural resource. The film asks the question: is water a commercial good like running shoes or Coca-Cola? Or, is water a human right like air? The film intimately captures the public face of Maude Barlow as well as the unscripted woman behind the scenes. The camera shadows her life on the road in Canada and the United States over the course of a year as she leads an unrelenting schedule. From 2008 – 2009 Barlow served as the U.N. Senior Advisor on Water to Father Miguel d’Escoto Brockmann, President of the 63rd Session of the United Nations. But, Water On The Table is more than a portrait of an activist … It is a poetic-essay that presents several dramatic and artfully crafted debates. Barlow’s opponents are giants in the world of policy and economics and they argue that water is no different than any other resource, and that the best way to protect freshwater is to privatize it. It is proposed that Canada bulk-export its water to the United States, imminently. Cinematic haiku-style images by Steve Cosens linger on watersheds, wetlands, rivers, estuaries, waterfalls and lakes, bridging themes and questions and elevating water beyond the political framework explored. 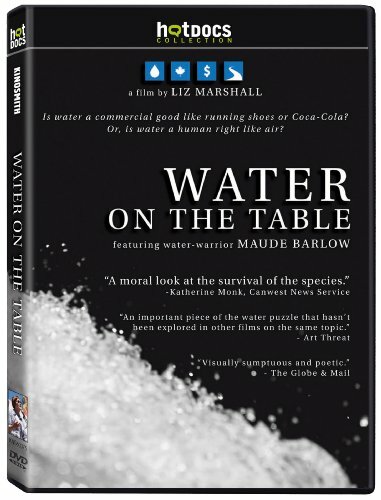 While many embrace Barlow as a leader in the global water justice movement, others regard her as an alarmist and agitator. She became involved with the issue of Canada’s water in the mid-1980s, when it became clear that it was to be included as a tradable good in the Canada -US Free Trade Agreement. She tried very hard to get it removed, then stayed involved in the fight for Canada’s water when it was included in NAFTA as not only a good, but also as an investment. Water has since defined her.